Not all vehicles have timing belts. The ones that do will cost you more to maintain (for cheap motoring, choose a car with a timing CHAIN instead). Changing timing belts are not an optional extra, if they break, in most modern engines, the engine will be basically non-repairable (expect repair costs to be between $4000-$7000). 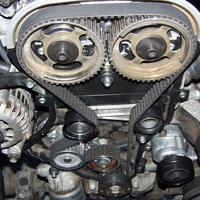 The timing belt connects the crankshaft (which drives the gearbox), to the camshaft/s (the one pictured has 2 camshafts at the top of the engine). Some cars need timing belts done every 150,000 (or 8 years), and some every 60,000 (or every 4 years – like the German built Astra or Viva). It takes around 4 hours to fit a timing belt to a 4 cylinder. The front of the engine has to be removed. V6 engines with a timing belt (Magna, Camry), are more complex. Some engines have the water pump running off the timing belt, and it’s good policy to change the water pump at the same time on these vehicles. I NEVER recommend changing a timing belt WITHOUT changing the idler and tensioner pulleys as well. It is truly false economy, but it can be done at the customers request. Vehciles with hydraulic tensioners can be very expensive to replace ($1600). MOst timing belt jobs come in at between $500-$1000. It is worth knowing about your timing belt BEFORE you purchase a vehicle.